Looking for an experience that’s “out of this world”? 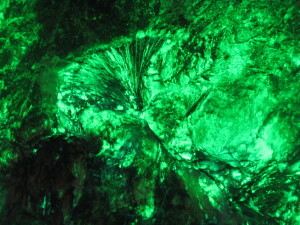 Emerald Village offers night-time underground mine tours that unlock vibrant hidden colors available only under ultraviolet light, commonly called black light. The brilliant coatings in the Bon Ami Mine are largely deposits of Hyalite Opal, a true form of opal found in this area. Under shortwave ultraviolet light, these coatings fluoresce or glow a vivid lime green. The effect, underground at night, is stunning! There are other fluorescent minerals here, too, including Feldspar that glows pink to red, Manganapatite (?) that glows cream to orange, and a rare phosphorescent blue mineral which, so far, has not been identified. Here are some of the world’s largest deposits of Hyalite Opal, and the only known underground Hyalite Opal deposits open to the public. The black light tours are only offered on 10 special nights. Custom Group tours of 25 or more can sometimes be arranged. The tour is a guided tour, led by our professional staff. We provide the high-power ultraviolet lamps, flashlights, and safety glasses. You provide comfortable walking shoes and a curiosity for unique experiences! The tour lasts about 45 minutes. Cost of the tour is $15.00 for adults and $10.00 for students (grades 1 through 12). The tours are generally conducted regardless of the weather, but can be suspended for lightning or extremely poor conditions. Bring an umbrella if weather is bad, and call ahead to confirm the tour is on. A light jacket is always a good idea. We hope to see you underground at one of the most unique experiences available, the Black Light tour at Emerald Village, home of REAL mines and REAL fun! Remember that Emerald Village closes after daytime activities at either 5:00 PM or 5:30 PM depending on the season. We recommend you go out for dinner at one of our fine local restaurants and return for the Black Light tour. The gates re-open 45 minutes prior to the tour times shown below. We suggest you arrive about 30 minutes prior to the tour times listed below. Special guided tours begin at Dark! The black light tours are offered on 10 special nights. Custom Group tours (25+) may be possible w/reservations. 45 minute guided tour is led by professional staff. Bring your camera for awesome photos!